A health diet includes plenty of vegetables, whole grains, fruits, lean meats, healthy fats and leafy greens for its core menus. Eating a diet that includes vegetables in many of its meals also can lead to a reduced risk for developing heart disease, some kinds of cancer, obesity, obesity-related conditions and Alzheimer's disease. Roasting turns ordinary vegetables into extraordinary meals by enhancing flavor and texture. 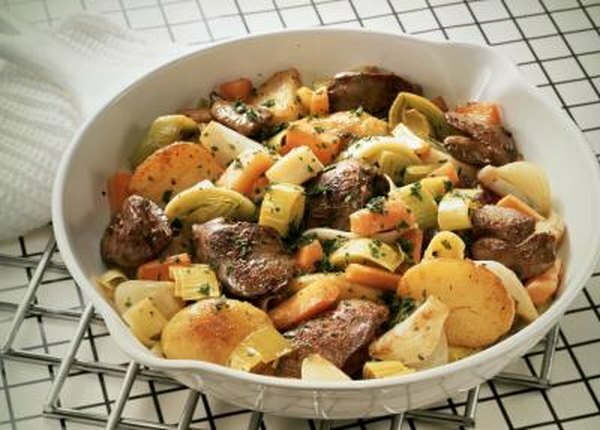 Roasted vegetables can be a mainstay, particularly when minimizing meat in your meals. Vegetables, higher in antioxidants than meat and dairy foods, can lead to reduced LDL cholesterol, or low-density lipoproteins. A diet rich in fresh vegetables cooked or baked in healthy fats like olive oil can reduce cholesterol and triglyceride levels that lead to clogged arteries. The process of roasting vegetables usually includes a form of oil that can change the nutritional value of the dish. Olive oil is one of the healthiest options. In contrast, many other oils contain high levels of saturated and trans fats that lead to obesity and are associated with medical conditions such as type 2 diabetes and heart disease. Virgin and extra-virgin olive oil used to cook roasted vegetables are the least processed, and contain the highest levels of omega-3 fatty acids and antioxidants. A wide range of colorful vegetables can be included in a roasted vegetable dish. You should have seven to 10 servings of fruits and vegetables per day to meet your nutritional needs, and the food should vary in color. Popular vegetables included in roasted vegetable dishes include carrots, onions, eggplant, red, green and yellow peppers, onions, mushrooms and squash. Fresh vegetables that are locally grown provide the richest sources of nutrients because they haven't been subjected to the chemicals and early picking required to deliver them. One medium fresh bell pepper, for example, contains 190 percent of your daily requirement for vitamin C. The same pepper delivers 4 percent of your daily iron needs and 2 percent of calcium requirements. Fresh vegetables roasted in olive oil can satiate you and keep you full longer than many other foods. A two-cup serving of roasted vegetables following a recipe found on Cleveland Clinic, for example, has only 150 calories and just 4 grams of healthy fat. The dish is high in dietary fiber and has no cholesterol. Roasted fresh vegetables also are high in phytonutrients and vitamins A and C.